”] Jamaica’s Governor General, Sir Kenneth Hall has resigned as the country’s head of state for health reasons after three years in the office and Prime Minister Bruce Golding has almost immediately announced Hall’s successor as Dr Patrick Allen, an educator and Seventh Day Adventist minister and administrator. Critics have already questioned Allen’s bona fides for the job as the titular head of state who embodies the nation above the political fray. That he is a Saturday Sabbath keeper who maintains the Mosaic diet laws that excludes pork are being raised as obstacles to the performance of his duties on state occasions that may require work on his day or worship. These considerations have not in the past affected the ceremonial duties of governors general since Sir Clifford Campbell succeeded Sir Kenneth Blackburne as the first native Jamaican head of state in 1962. It is a non-issue whether his Christian background will cause a rift in a country whose national anthem begins “Eternal Father, bless our land…,” as all the office holders since Sir Clifford have been Christians who did their jobs as the representative of Britain’s Queen Elizabeth II, according to the law. They performed ceremonial duties, the most important being the appointment of the prime minister and leader of the opposition, prorogation of parliament and calling of general elections on the advice of the prime minister and signing acts of parliament into law. Only once, when the 1972-80 People’s National Party (PNP) administration of Michael Manley was criticised by its appointee Florizel Glasspole, a former education minister in Manley’s government, was there a querying of the behaviour of an office holder. Glasspole had cautioned against the extreme left wing activities of his former colleagues. Perhaps more important than whether Allen will attempt to convert all Jamaica to Christendom or his Adventist sect, is the real role of the office in the constitution and in nation building – matters that concern all former British colonies in the Caribbean and even in Canada and Australia where voices have been raised to distance the independent states from the British monarchy, its “heirs and successors”. A pertinent scenario was in October 1983 when Sir Paul Scoon emerged from obscurity to be enrobed with the responsibility of “inviting” President Ronald Reagan’s forces to rescue Grenada from the People’s Revolutionary Government which had murdered Prime Minister Maurice Bishop and overthrown his government that had itself staged a bloodless coup d’etat against the elected government of Sir Eric Gairy. There is probably still debate in legal circles whether Sir Paul, whose office in the revolutionary government was questionable, was a legitimate actor; and many remain convinced that the invitation floated from Dominica’s then Prime Minister, Eugenia Charles – Dominica, ironically, being along with Trinidad and Tobago and Guyana the only former colonies to declare republican status and replace the Queen as head of state. From Bridgetown to Kingston, there has been talk of constitutional reform to fully repatriate the centre of power to the countries by discarding the monarch for republican status. Jamaica is particularly wedded to Britain with even so-called progressive lawyers objecting to the mere notion of eschewing the Privy Council for the native Caribbean Court of Justice, contending that the region’s judiciary is somehow not able: Jamaica the land well known for producing Marcus Garvey the black internationalist and the Rastafari movement one of whose main spokesmen was freedom fighting artist, Bob marley. With more than 1,500 murders a year for the past five years in a population of 2.6 million, with chronic unemployment and a downward spiralling economy for years before the global financial crisis, the country has displayed an incapacity to act that probably reflects the lack of self confidence despite the braggadocio surrounding the achievement of its athletes and musicians above the norm for the country as a whole. Not surprisingly the successes are in areas where hardship forces reaction. Maybe we, Jamaica and the Caribbean, should do away with this GG foolishness. What is this pastor going to do to enable progress? And if the Queen is the titular head of the Church of England, how does she have representing her, a cleric who believes Protestantism is a spawn of the devil? 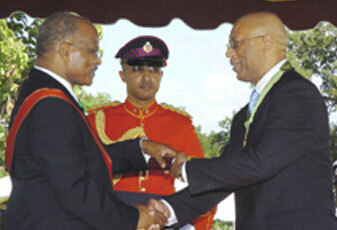 So will a new governor general of whatever denominational stripe cause Jamaica to turn around? We don’t think so. Not all the think-tanks in the world, with action teams galore can undo the damage done to the people. They are so messed up. After living through so much gore, it has become them. Call us nihilist, but the whole system needs to be taken apart, with fresh faces and new blood to rebuild – no, strike that, build the nation. If there is no effort made to make those responsible answer for their criminal acts, then all we are doing is patching potholes. Totally anachronistic and irrelevant for today’s Jamaica.This dinosaur — Governor General — is a throwback to the Paleolithic age. This is just another absurdity of Jamaica’s backward and underdeveloped politics. The position or the office of the GG needs to be jettisoned and Jamaica be transformed into a constitutional republic with a presidential system ,with the power vested in the prime minister and the Queen of England’s role as the sovereign head of the island diminished and marginalized. As this article points out, there are many contradictions with the selection of the new GG. However, most of these issues will be nullified when he takes the Oath and is knighted by the Queen of Jamaica. Nevertheless, I totally agree that constitutional reform is needed, but not in the way many argue. In arguing against the GG position, Esteban stated that it “is a throwback to the Paleolithic age.” This is incorrect as the Paleolithic Age was some 750,000 years ago when there were no states and organized governments. Most governments are hierarchical wherein a top office is granted the authority to make critical decision (e.g., dissolving parliament, calling referendums, and granting pardons). The GG not only represents the Crown, but ranks above ordinary governors and generals. This position is relatively new (i.e., a 20th Century phenomenon) and is still found in former British colonies including Australia and Canada. Thus, it is not anachronistic or irrelevant, or a determinant of JA’s backward and underdeveloped politics. Those who say the GG position should be “jettisoned” and replaced with a president are “swapping a dog for a monkey.” Simply changing titles does nothing to solve our issues. Transforming JA’s government from a monarchy to a republic is very progressive, but vesting power in a prime minister or president contradicts the nature of a republic for which power belongs to the people – republics have no monarchs. Thus, not only would we need to change our constitution, but we MUST change our social patterns. Simon Bolivar learned firsthand that simply copying the US Constitution does not guarantee an effective republic. Although Bolivar is endeared as the Great Liberator, most of his attempts failed as dictators and tyrants merely replaced colonial governors. He learned that democratic principles and processes must be entrenched in all sections and at all levels of society for “government of the people, for the people, by the people” to be properly realized. As we transition to a republic, we can start by election of the abovementioned officers but also make sure that our children learn and practice democratic principles and practices. This is extremely critical for creating an effective republic. We must also deeply entrench the human rights provision of the Jamaican Constitution – the natural rights of a free people must never be abridged, especially by the decision of a single person or a few members of our society, under any circumstances. Richard, one is extremely cognizant and knowledgeable as to what constitutes the Paleolithic Age.Also,such information can be easily acquired or ascrtained from WIKIPEDIA, or for that matter, any encyclopedia via the process of GOOGLING. Notwithstanding, my intention or objective regarding the utilization of the period and the term ,or, expression in characterizing the office of the Governor General is /was to amplify, magnify, and underscore the fact or point, that as far as I am concerned, the office or position is outmoded, in a somewhat similar manner to the horse and buggy. I am sorry that your interpretation of the expression was so literal as opposed to figurative.Nonetheless, in your commentary,you do raise many interesting points which I do endorse and support wholeheratedly, namely,the question of power being vested in the people, the question of human rights, the socialization of our children in democratic principles and practices, inter alia. But like the ABENG editorial contend(s), “Maybe we, Jamaica and the Caribbean should do away with this GG foolishness.” I strongly and categorically support this perspective and it transcends hackneyed,banal and cliched statements/expressions such as ” swapping a dog for a monkey”. Copious respect !! Before we suggest doing away with the GG position, we must first define the position (i.e., role and purpose) and its historical context in JA. If it is as outmoded as stated, then why does it still exist in advanced, progressive countries like Australia and Canada? Until this question is answered, we cannot imply that ANY of JA’s problems will be solved by changing from a GG to a president. The Paleolithic Age was identified to inform other readers and to make a timeline contrast, as the GG position is relatively new compared to other positions such as a governor, which is still used in the US. Many would argue that Grenada would have had wide scale civil war, if not genocide, had their GG not requested US help. This does not mean I supported the intervention or context (i.e., Monroe Doctrine, Soviet expansion), but it does show the role of a GG in acting in the interest of ALL its residents when political entities refuse to build consensus or make compromises, but resort to violence. One will learn the intricacies involved in designing effective, democratic governments by studying the Federalist Papers. Balancing power and avoiding tyranny, were some of Madison’s key goals. Maybe JA needs to keep the Sabbath Holy and have regular national Prayers and Fasts! –> the queen does not care *who* the GG is, as long as some basic requirements have been met (which we don’t even know, do we?) but probably includes the criteria of 1.) attained national recognition and stature, 2.) has demonstrated evidence of educational achievement; 3.) seems to know how to behave and comport him[not yet her]self to resemble some undefined person called a “statesman”; and 4) is a friend of the Prime Minister. On the part of the queen, this is purely ceremonial and not at all political. As long as the candidate doesn’t embarass her, they are fine. –> the misunderstandings about the role of the GG is actually very useful to the PM who is looking to accrue more power for himself to carry out his political agenda. Since the GG is appointed by the PM, then the GG is politically beholden to the PM, and does not act independently of the PM. While there are only a few roles that the GG actively plays in full public view e.g. the pomp and circumstance of parades, etc., and the signing bills into law, there are other roles that the GG can play which are not as public and are far more political than the “ceremonial head of state” title would suggest. The recent debacle over the PSC and Vasciannes is such a reminder. In the PM’s playbook, the position of the GG merely extends his powers. The GG position can be an important pawn in the machinations of power and BG and his folks know this. In effect, BG is already acting like President, which he clearly wants to be, but without the necessary changes that would make him accountable to the population. This is a serious cause for worry and which we should begin to address immediately. While the GG has appeared to be quite benign, the PM is being pretty savvy about who he appoints to that post. Indeed, I suspect he has been prepping up for this for the past few months when he has been saying in speeches that “the church” must and should play a greater role in national affairs. I strongly suspect that he was referring to his appointment of Allen. The GG position may exist in “more advanced” countries like Canada and Australia, but they don’t have governments that are nearly as corrupt and inscrutable as we do. Nor do they have a population that is virtually excluded from access to the basic information that would allow them to be more active in matters of politics at the national level. So yes, get rid of the GG – for the symbolic and political reasons addressed above – but we also need to curb this PM and fix this system. Permit me to reiterate that I am in full support of removing the GG position, but I do not support simply replacing the GG with a president. Changes to our constitution require carefully study, critical thinking, open discourse, and in-depth design. While not perfect, our government was designed based on our inherited traditions and history, as well as movement from slavery thru colonialism to independence. We cannot achieve effective and sustained governmental reform if we do not first get the facts and then engage in deep intellectual discourse without making wild assertions. For instance, it was falsely stated that the PM appoints the GG. The fact is that the Crown appoints the GG and the GG appoints the PM who in turn recommends the GG. By making false assertions, the writer and the readers do not gain an understanding of our system of checks and balances, as well as the balance of power that requires that almost every action of our government be reviewed at two or more levels. Unless in critical situations (e.g., wars and state of emergencies), no officer can act alone – their action must be reviewed for continuation ASAP. There are other issues to comment on but that may divert the discourse from the issues I had addressed in the “Amendments to the JA Constitution Proposals” submitted to the Joint Select Committee of the Houses of Parliament in 1991. Below are links to inform the writers and readers about the design of our government and officer’s role. They are not included to point out errors, but to supply the discourse with useful materials for which we can properly define the role and purpose of the GG, the Jamaican context, as a pretext to achieving the “Republic of Jamaica” with a directly elected President. Richard, you are correct on the need for exactness. But when last has the Crown appointed a GG other than the nominee of the head of government? The PM nominates someone s/he expects the sovereign to appoint. Pity no one born in Jamaica, of whatever class or stock, qualifies to be or wear the Crown. Since we are taken with tokenism, what’s wrong with the symbolic change to a ceremonial president who behaves pretty much as the current office of the GG does but without some obscure Crown in the shadows? And I’m not saying that ought to be the option; just for argument’s sake. In JA’s design, it may well be that the framers of our constitution intended for us to grow in political maturity and shift from dependence on the waning British Empire – the Crown did say that much in her JA Farewell address. Thus, a symbolic change to a ceremonial president may not hurt or change much, if we continue using the Westminster Model. However, the framers were also aware of the Cromwell and American Revolutions, wherein the appointment of “insensitive” non-local governors led to costly rebellions and the loss of the highly prized American colonies. Thus, a local, highly respected citizen, upon the recommendation of the duly elected minister (who commands the support of a majority of Parliament) resolved the Cromwell-American problem. The suggested ceremonial president is an incremental change, but due to JA’s chronic problems and volatility, I strongly suggest a comprehensive change. This would mean directly electing our President (as in Germany or through the elevation of the PM). However, in granting more power to the Head of State, we must provide a credible system of checks and balance to prevent tyrannical rule. An elected Senate best performs this role rather than the “rubber stamp” automatic majority PM recommended appointees. To complete this design, each Senator will reflect their parish’s views and goals, while each member of House will continue to reflect their constituency’s views and goals. Most importantly, before we become the Republic of Jamaica, we MUST uphold and deeply entrench the Human Rights provisions of the JA Constitution. Once this is done, there would be no need to appeal to the CCJ or thru the GG to HRM’s Privy Council.